Don’t lose productivity when you’re on the go — use Microsoft® Office Mobile* to get the Microsoft software you’re familiar with on your Windows Mobile phone. 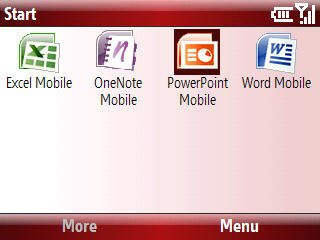 Use Office Mobile to open and edit Word and Excel® documents, and view PowerPoint® presentations. When used on a touch screen phone, Office Mobile comes with some additional features, such as word count and the ability to check spelling in Word Mobile, chart creation in Excel Mobile, plus the ability to highlight sections of content and create documents. With Microsoft® Office Excel® Mobile*, you can update your data on the go. Excel Mobile features a rich viewing, experience which lets you work with your spreadsheets just like you do back at the office. Plus, when you edit spreadsheets on your phone, the formatting and changes are updated automatically, so they look the way they're supposed to when you open them on your PC. Excel Mobile works with Windows Mobile 5.0 and Windows Mobile 6 and, when used on a touch screen phone, comes with additional features that allow you to create new documents and charts, as well as copy and paste formulas. View and update documents that look much like they do on your PC. Microsoft® Office Word Mobile* lets you open, view, and edit documents while you're on the move. Save changes and be confident that edits and formatting will come through intact when using your phone to open a document. Word Mobile puts the features you use every day at your fingertips and works with Windows Mobile 5.0 and Windows Mobile 6 phones. It comes with additional features when used on a touch screen phone, including spell check, cut and paste, word count, bulleted lists, and find and replace commands. Why not use travel time to practice your presentation? With Microsoft® Office PowerPoint® Mobile*, you can view and rehearse your slides when you're away from your desk. PowerPoint Mobile is available for use with Windows Mobile 5.0 and Windows Mobile 6, and will work on both touch screen and non-touch screen phones.